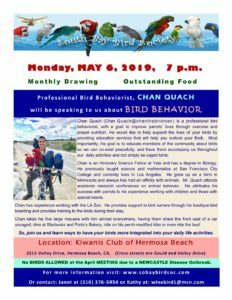 The South Bay Bird Society is happy you’ve flown over to see us! 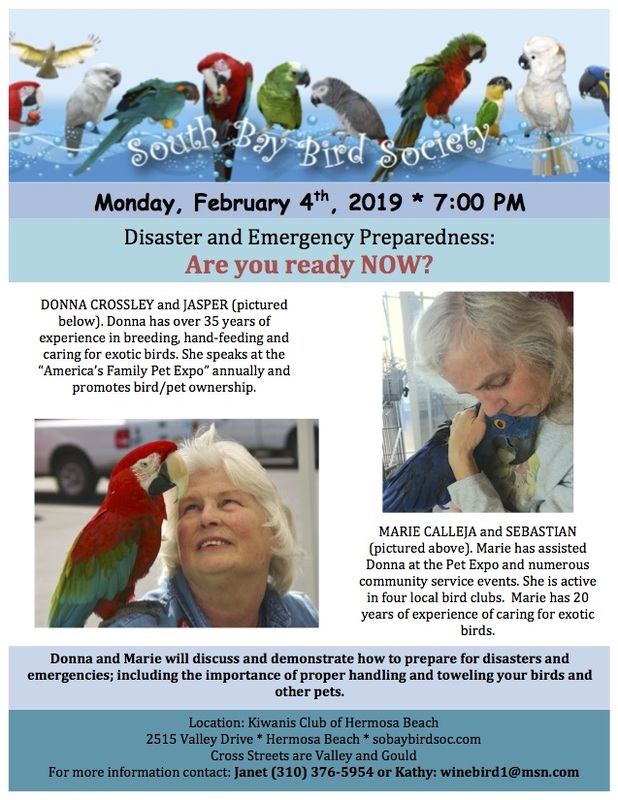 We welcome you and your flock to the South Bay Bird Society. We are so happy to see you. We’re shaking our tail feathers and inviting you inside. 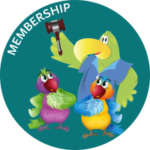 You are welcome to meet the other members of our flock and we look forward to finding all about yours. Our goal is to share all the things we have learned along the flight path, including teaching our humans how to care for us. 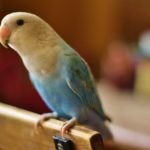 You may have questions or you may be in need of assistance along the way about how to care for your birds. Check out the entire SBBS website and, if you haven’t found the answer, you can always contact us or attend an SBBS meeting. Plus, have fun along the way! We are always open to your suggestions and ideas! 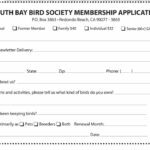 What are the benefits to you of joining the South Bay Bird Society? Formerly known as the" South Bay Bird Club" prior to 1997. 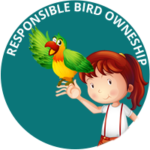 In addition to getting a glimpse of our activities and resources, you will also find a wealth of information on having birds, living with birds, and caring for them. Another benefit is that when you join SBBS and pay for 2 years membership, your second year’s membership fee is discounted by $5. In the wild, birds forage for food throughout the day. 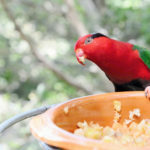 Our birds need a varied diet of vegetables, fruits, pellets, nuts, and protein. If you can, feed organic! There are foods and beverages that you would never feed your birds - avocado, raw or uncooked protein, chocolate, caffeinated or alcoholic beverages. Symptoms of a sick bird: unusual droppings, ruffled or puffed up feathers, sitting at the bottom of the cage, inflamed runny ceres or eyes and tail bobbing. Other symptoms are breathing with its mouth open or loss or appetite! Do a visual daily check of your bird! 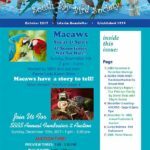 See a board certified avian veterinarian or avian specialist! Not all veterinarians are knowledgeable in the field of avian health care! When purchasing toys for your bird, the most important factor should be SAFETY. In the wild, birds find many things to play with such as tree bark or a vine or nut! 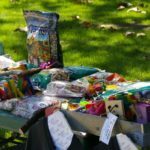 Toys not only give our companion birds exercise, but can also satisfy this destructive nature and their need to chew or feather pick! 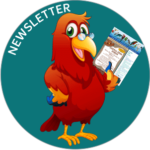 One of the benefits you receive from your membership is full access to our newsletter archives. Click here to enjoy them. 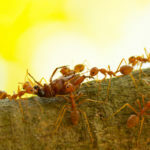 Want To Find 10 All Natural Ways To Get Rid of Ants? In 2016, the FBI made animal abuse a felony. Since then, the worst animal abusers are no longer looking at a slap of the wrist as the FBI has reclassified animal abuse, making it a felony. As far as the nation's top crime fighting agency is concerned, animal abuse is felony, just as arson, burglary, kidnapping and murder. Starting in 2016, the FBI will now keep track of animal cruelty the same way it does homicides.